P-Scales is the UK's new curriculum for students who are not yet functioning at level one on the national curriculum. Please, for the love of everything scared, would the state of Massachusetts take note and drop the sham of forcing teachers of students who are functioning, say five or more years below age level, to pretend they are learning algebra and physics. Please? As I have written before I often use ESL/ELL materials for my students, as it is an easy way to find simple materials that are age appropriate. Larry Ferlazzo's website provides a plethora of links to great sites divided by theme. On my most recent visit I was looking for materials to teach reading through cooking activities and I found exactly what I needed. I wish I had checked Larry's site first. There are over fifty themes to chose from on the website with great links under each and even more themes on Larry's Beginner Page. More resources are available on his teacher page and I strongly recommend signing up for his blog on your RSS reader. A few years ago I started adding visual glossary attachments to IEPS and Educational Evaluations. These glossaries are simple to create. For the IEPs I write down all of the equipment a student uses in a day or week, such as a supine stander, a wheelchair tray, a maroon spoon, a Jelly Bean switch, dycem, wrist splints, etc. Then I go to the website of the vendor of each item, cut and paste an image, the description of the item, the name of the item and the website to a word processor document. Once it is complete I attach it to the IEP. That way parents and administrators have an image of what we are talking about and if the student moves the receiving teachers and therapists will know what we are using. For educational evaluations I do the same thing for any equipment, assistive technology or specific curriculum I am recommending. Before you read this go down two posts and watch the My Voice is My Power video from the 1 Voice Website. In my career the most expert AAC user I have ever taught was a young man who is now a student at a residential school. This past school vacation week I had the privilege of providing a day of respite care for him while his parents worked. As I told his parents I was excited to do this because I miss him very much. Unfortunately the school did not send his communication device home for the school vacation. That made a what I was expecting to be a fun day for the two of us very challenging. I spoke with my friend who was this student's speech therapist much of his life before he moved on to his new school and she said what I had been thinking, "When he has his device you don't even think of him as non-verbal." His voice is his AAC device and his AAC device is his power. With his device he can express pretty much any thought or idea. He can navigate his world. Over and over again during the day we spent together I realized how much independence was taken from him and replaced by dependence by not having that box of talking pictures hanging from a strap around his neck. "Burger. Chicken Sandwich. Chicken nuggets. Fish Sandwich..."
He got distracted and started banging the railing dividing the lines waiting to order. I pulled his attention back and recited again, "Burger. Chicken Sandwich." He interrupted with a "yes" response. I say, "O.K. Chicken Sandwich..."
He interrupts with a definite "no" response. I reassure him and start over, "Burger. Chicken sandwich. Chicken nuggets. Fish sandwich." He responds "yes" to the fish sandwich and I tell him that is what I am having too. We move on to side choices. I recite, "Fries. Yogurt. Chili. Baked Potato." He walks away distracted by a huge poster of the fish sandwich. He excitedly points to it and I affirm that we are having the fish sandwich. It will look like that. I redirect back to side choices (inwardly groaning because we are next in line and we still need to decide on a drink choice and thanking God we do not need to choose a dipping sauce for chicken nuggets). I start over, "You need to choose a side. I am having a baked potato. The choices are fries. Yogurt. Chili. Baked potato." I repeat so he can choose, "Fries. Yogurt." "Ok, yogurt it is." Then I abandon best practice. It is our turn, "You want Diet Coke, right?" He indicates "yes". I silently thank God. I order two Fish sandwich combos with Diet Coke, medium, one with yogurt, one with baked potato. Then he grabs my arm and starts rather frantically pointing at the sign displaying the kids meal. I shake my head no. He grabs my arm again and points more discreetly to the milk in the display. "Oh, you want milk? Not Diet Coke?" Yes, yes, yes, he responds. I change the order. The red headed Wendy's worker, who had to have been hired for the red hair, starts to get annoyed. We finally get our meal and sit down and I do my best to keep up an entertaining conversation while my former student, now friend, comments with noises, adapted sign language and the occasional word or phrase. As we are about to clean up I tell him that when he comes home in April (the next school vacation, when we are hanging out again) he better bring his ChatPC (AAC device) with him because it took us almost ten minutes to figure out his order when he could have placed it all by himself in under two minutes. He nods empathetically, agreeing to bring it home with him. His voice is his power, if only he had had it with him. The new PowerBox 4 is the latest generation of our successful PowerBox. In sleek black, the all-new device seamlessly integrates a powerful touchscreen tablet computer with a bespoke back box unit, housing accessories for communication and environment control. The PowerBox 4 combines the power of a Windows XP tablet computer, in a sleek lightweight form, with a 12.1" LCD touchscreen that can respond to finger touch. Other access options include switch input, with the option for radio switches, as well as head-pointer, keyboard and mouse. Dimensions: 11.53" x 8.66" x 2.5"
A range of mounting options, from built-in desk stand to optional Daessy wheelchair or VESA arm mounts makes it an ideal solution for many users. Here is a link to a fantastic page of activities and resources for what is called in the UK P-scales special needs students (P-scales is what in Massachusetts is awareness level of the curriculum, elsewhere it is called emerging level or cause and effect level). I have not yet explored all of the activities, but the ones I have are excellent. The site is called the Plasma Screen and White Board Room. If you don't have a Plasma Screen or White Board, a touch screen will do. The link only seems to be working if you get to it by going through the ttrb SEN site and then clicking on the link to the Plasma Screen and White Board Room at the bottom of the page. The activities are designed to work on Power Point, Opus or SMART Notebook (viewers are available if you do not have the applications). The areas of the curriculum offered match the UK national curriculum (kind of like logging into the UK part of Learning Grids for Clicker 5). Some notes: RE is Religious Education, PMLD is Profound and Multiple Learning Disabilities (look here for cause and effect, scanning, social/sensory stories), Design and Technology often includes cookery, PSHE is personal, social and health education. Take some time and explore some time and download some activities. Then upload some in return! Have you been walking around with a great classroom idea in your head for weeks? Maybe you even got as far as drafting a proposal at DonorsChoose.org? Well, now’s the time to take the next step! For a limited time we invite Bay Area teachers to submit any proposal at DonorsChoose.org and our sponsors will fund the first $50. That's right - $50 for every proposal submitted by February 26th! Submit your project idea(s) by Tuesday, February 26th! What if I already have a project posted? Submit another (and another and another)! Remember, a first-time user can submit up to 3 requests; a DonorsChoose.org veteran can have even more projects posted at any given time. Any Bay Area proposal submitted by February 26th will receive $50. You must be an educator in the Bay Area and submit your proposal(s) by Tuesday, February 26th. Only NEW proposals are eligible – we will not fund a proposal that is already posted. Application of funding may take up to five days, so we thank you in advance for your patience. Share the wealth - spread the word! 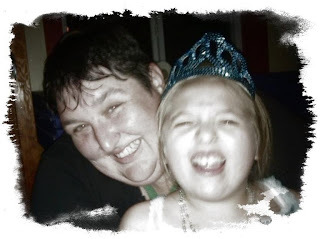 One of the great things that has happened as a result of writing this blog is contact with other educators, bloggers, parents of children with disabilities and people who own or work for companies that make for products for people with disabilities. Last night I was contacted via the Meebo instant messaging button over on the left of the blog by the Barker Creek company. 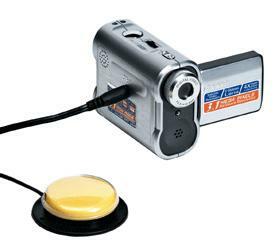 Barker Creek makes a number of great products but the one I had written about on my blog is Mayer-Johnson Picture Communication Symbol Magnets. I have a full set of these in my classroom and we love them, and we have had visitors leave with photocopies of the catalog and order form because they wanted their own set. During my chat with the Barker Creek representative last night I suggested the Mayer-Johnson Picture Communication Symbol set I wish they sold, a schedule set. I already use the magnets on a bright red cookie sheet as a schedule board, but some common schedule items are missing and a package of schedule related PCS magnets would be great. Look for it in the next year or so the representative said! I know most folks don't follow the comments on this blog (because of how I have it set up, mostly). So I thought I would repost the Dream Changes for Boardmaker 7 Post with the Comments from readers and Mayer-Johnson and myself. What I mean by a "pop out" is when I am making multiple boards by changing the "print setup" to say, 32 by 32 inches, and I want to see just one board full size on my screen (so I don't spell something wrong or mess up the details) I have to go to view and then scroll to that board, which is hard on a laptop. It would be nice to hit something, a keyboard short cut, a menu button, and have the board I am looking at in miniature pop up larger automatically. Some time ago, (last March) I wrote a blog post about doing Sensory Rooms on a budget. Now that Donors Choose is in the picture I would strongly recommend you use Donors Choose grants to get the materials you need for a sensory room is you work in a school. However, here are the links from last years post, they have been checked for 404 and other errors and there are some new additions. How do I set up a sensory room in my classroom? This will be the permanent link for the Teaching Learners with Multiple Special Needs listing of free Boardmaker boards. Please bookmark that link if you need to. It was last updated March 22, 2013. Please feel free to send me links of pages that host boards and activities in any language. You can find out more about Boardmaker at Mayer-Johnson. use Boardmaker Plus or Boardmaker SDP, Clicker or Classroom Suite to create a Calendar Program (or download on from the sharing websites) and replace your chart with your interactive white board. My class has a dream! (We actually have lots of dreams.) We want an interactive white board. We would love an interactive white board! It has been a rough year for us. We transferred to a barely handicapped accessible build and had many, many staff changes. We are hoping you want to help us out. Here is a link to our Donors Choose Grant to get an interactive white board! Would you consider even giving us $20 of your tax refund? Sometimes you need to clean up an image to import it into Boardmaker or you need to resize it to use it in a teacher made book or worksheet. I tend to use the two photo editors which have add ons in Firefox, Snip Shot and Picnik, but I also us Pixenate which has more complex tools and flauntR which embellishes as well as cleans up photos. Save these links to your book marks in case you need them. Also VectorMagic is not a photo editor by turns images into high quality vector images like those in Boardmaker, perfect for picture you plan to import into Boardmaker. And Sporkforge which turns a photo into a sketch which is fun as well. Bubble Joy is a great new video greeting card service that allows you to send richly interactive and fun video greeting cards to all your friends and family. Whether it's a special occasion or you just want to say hello, with Bubble Joy cards, your recipients will finally be able to both see and hear what you have to say, rather then just read about it. So get started now and starting spreading some Bubble Joy around to all your friends and family. PRC has released a very cute device called the SpringBoard Lite. 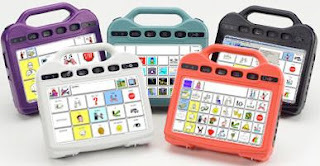 Like the Dynavox M3 it is for AAC beginners or emergent communicators. The device is pretty tiny and looks a lot like the OLPC at first glance. It is a dynamic display device using Minspeak Icons or Mayer-Johnson PCS symbols and digitized (groan - that means you record it yourself... i.e. your voice on some kids device) speech. It has all the fancy things like IR environmental controls, visual scenes, and limited bluetooth. It also has a great offer of integrated Intellitools Classroom Suite, which may end up being a real selling point. Of course it may be a Lite device, but it doesn't come at a Lite price at over $2,00o. It means committing to Minspeak for the user, which means committing to training everyone else in Minspeak and hoping the user "gets" it. Lastly I will make the same point I made about the M3, why bother getting an "emergent" user device? The price is not that different so go for the gold, just get a Springboard or a Dynavox V or whatever the non-emergent device is so the child isn't stuck with it until insurance or the district will pay for the "real thing". Plus, digitized speech, ick. PRC is proud to introduce the new SpringBoardTM Lite, a smaller, lighter, and simplified version of our popular SpringBoardTM speech output device. Designed for children and other entry-level AAC communicators, SpringBoard Lite measures just 7.3" square... weighs just 2.5 lbs.... is available in five bold colors... and features a built-in handle for maximum portability. Its simplified operating system makes the dedicated SpringBoard Lite easy-to-use right out of the box. And, with 4-, 8-, 15-, and 32-location display options, its communication capacity can grow along with the user's capabilities. Five integrated versions of pre-stored vocabulary using 4-, 8-, 15-, and 32-location options with a special emphasis on those core words that power most speech. Pre-stored Activity Row categories and vocabulary plus Pages with expanded word sets. Six User Areas for creating transitional vocabularies, storing vocabularies for multiple individuals on one device, or creating and storing multiple assessment and training protocols. Specially created Visual Scenes for concept and language learning. Optional IntelliTools® Classroom Suite bundle. 8-, 15-, and 32-location clear keyguards to aid direct selection (plus custom keyguard options). USB connectivity for use with headpointing systems, mouse, and mouse emulation access products. The ease of changing access options makes SpringBoard Lite a valuable training and assessment device at schools and AAC centers. Widescreen TFT display for brighter, improved picture quality. Built-in media player for playing MP3, WMA, and WAV files in stereo. Infrared environmental control functions to control common IR devices, such as lights and TV/DVD players. USB flash memory port and Secure Digital card slot enable faster, easier memory backup and transfer options. Basic serial output to allow some computer access options. Pre-loaded male and female recorded voices. Optional Integrated Bluetooth® connectivity (for computer access and wireless switch use only). Access to over 3,000 Minspeak® icons in the device for customizing vocabulary. Over 8,500 optional PCS symbols for core vocabulary, Activity Rows, and Pages. Simple formats for importing icons or digital photographs to personalize the device and create Visual Scenes. Simple steps to creating Activity Rows and Pages for specialized vocabulary. New PRC Application and Support Software (PASSTM) has numerous special features, including an option to use simple drop-down menus plus tips and information to make it easier to customize and support the device. Pre-loaded or custom-built Visual Scenes pages make learning vocabulary more entertaining. Visual Scenes capability allows the creation of special teaching pages with "hot spots." Import a wide range of graphic formats, such as BMP, JPG, GIF, and many others. Introductory set of therapy exercises. "Exploration Wizard" for exploring targeting, picture recognition, associations, and vocabulary options. "Quick Start" print guide that highlights the device's key operations. PRC's Language Activity Monitoring (LAM) software for monitoring communication progress through the recording of each language "event." Vocabulary can be saved and transferred into more advanced PRC devices as skills expand. For about a dollar and a half you can buy lycra fabric book covers that are meant to stretch over text books. They also make great covers for most standard wheelchair head rests! A fun way to color coordinate, cover up that hole that's been worn in the headrest cover or just to brighten things up. You can find them just about anywhere school supplies are sold. I bought the pink one currently in use to cover up a head rest hole at CVS for a dollar thirty nine. Size: 6.5" x 3.5" x 1.9"
- Memory: 384 MB total with up to 256 MB (192 MB ROM and 64 MB SDRAM) available for programs and files. - Additional memory: 1GB Compact Flash card built into the unit. - Wireless: Bluetooth, Integrated WLAN 802.11b. - Operating System: Microsoft®Windows MobileTM5.0 for Pocket PC, Premium Edition. - Mobile versions of Microsoft software are included (Outlook®, Word®, Excel®, PowerPoint®, Windows Media®Player, and Internet Explorer®). The new Mayer-Johnson Catalog was in my mailbox today. The 2008 Boardmaker Addendum is out with 1300 new PCS for $29.00. Also finally a new version, or more acurately a totally new piece of software, to replace Writing with Symbols. It is called SymWriter. Beginning readers and writers gain extensive literacy support through symbol usage, and more advanced students also benefit from the language support symbols provide. Teachers, parents and therapists can quickly and easily adapt written materials with symbols to create stories, sentence strips, directions, recipes, schedules, songs, poems, worksheets and more. Also create computer-based activities with voice output and symbol support, such as topical writing and sentence building, spelling and counting activities, assessments and cross-curricular exercises. Beginning writers or individuals who don’t recognize text can write with symbol support and benefit from speech feedback. Or, text users benefit from a talking word processing program. Communicate: SymWriter is the next generation of symbol-word processing, with Smart Symbolizing—parts of speech automatically symbolize correctly. Windows Vista compatible. Widgit Literacy Symbols (WLS) were designed and developed to support, improve and assist learners’ emerging literacy skills A strong schematic structure supports understanding. Many of the 8,000 symbols support curriculum topics such as math, science and history, helping with comprehension of new and difficult concepts. SymWriter uses natural language processing to present the best symbol match based on parts of speech and the sentence structure. Encourage word building, composition and sentence construction with easily modified writing environments. Easily place images in the composition with Graphics on the Page. Viewing thumbnails of available symbols aids comprehension and allows for quick replacement of symbols.